Green-eyed Pursuit- New Release Live on Stage! 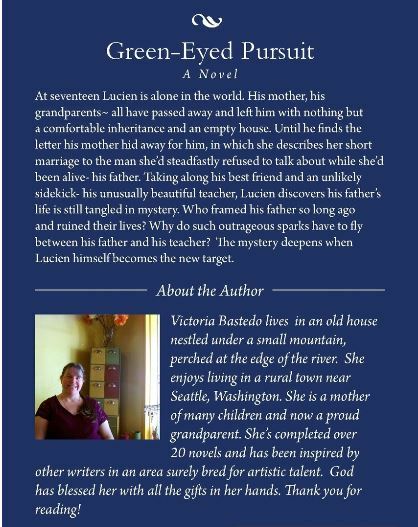 FVP Featured Author Victoria Bastedo has a new Young Adult Mystery novel available on Amazon, GREEN-EYED PURSUIT! The book will be available for the first time signed by the Author at the Bard & Starlet Radio Hour performance on May 27th at 7pm. A scene from the novel has been adapted by Victoria Bastedo for Live Performance on stage in Radio-play Style and will be featured as part of this Free Admission show at Boxley’s in North Bend, WA. May 27th will also be the Release Party for GREEN-EYED PURSUIT, so come down and celebrate this fun new read with Vicky, our other FVP authors and our community! This entry was posted in Community, Events, Mystery books, Young Adult and tagged Book Release Party, books, free plays, free theatre, literary performances, New YA books, Victoria Bastedo by freevalleypublishing. Bookmark the permalink.